Martin Sheen pens powerful letter to Trader Joe’s CEO Dan Bane in “fervent support” of the Campaign for Fair Food! 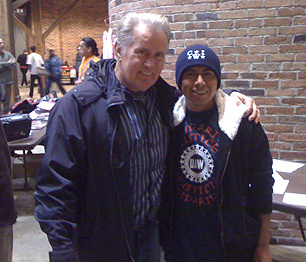 Martin Sheen (shown above with Wilson Perez of the CIW at last fall’s School of the America’s gathering in Columbus, Georgia, where Mr. Sheen gave a moving speech on the power of non-violent protest in the pursuit of human rights) is an Emmy Award-winning actor and widely respected activist for human rights. And, fortunately for us, Mr. Sheen’s commitment to human rights extends to the Fair Food movement, too! Late last month, as he has many times over the years before, Mr. Sheen lent his voice to the Campaign for Fair Food, calling on Trader Joe’s to live up to its reputation as a progressive grocer and sign an agreement with the CIW to support the Fair Food Program. We are extremely proud and gratified to count Mr. Sheen among the ever growing number of Fair Food activists across the country. We look forward to working more closely with him in the coming months as the focus intensifies on California-based Trader Joe’s! Click here for all the news from the previous year, A New Day in the Fields! Trader Joe’s set to open first Florida store… on Immokalee Road!